Get a deeper understanding of your users as they interact with your app. Build a profile for every user who visits your app, storing demographic data (gender, age, location) along with all their app and website interactions, campaign visits, and transaction history. This helps you devise a user-centric app strategy and maintain a comprehensive user database at the same time. With detailed user profiles, you have the data to reach your customers at the right time and on their preferred channels. Now create differentiated omnichannel campaigns to engage your users with advanced trigger-based messaging. 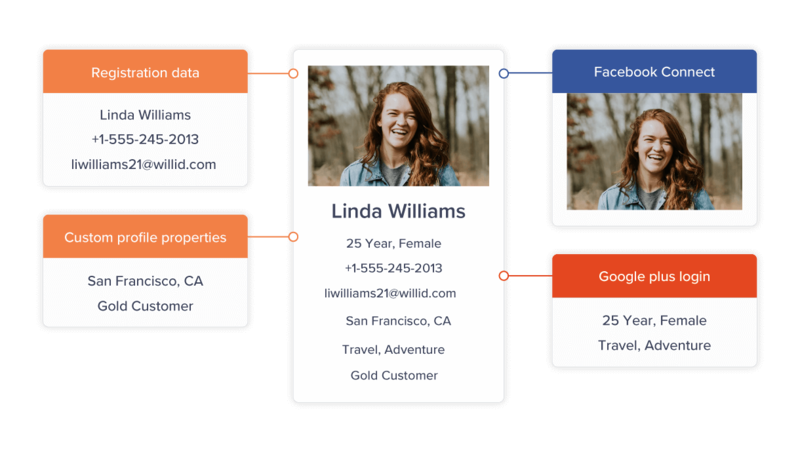 As you build complete user profiles, you gain the ability to create segments based on specific profile data that you define. For example: build a segment of all users who like Korean movies, or who live in Chicago. Now you can create a campaign that’s customized to their tastes or locations. With CleverTap’s Unified Profiles, you gain a single view of your users across all their devices. Discover how customers are using multiple devices to access your product or service. As mobile and app marketers, you’re constantly on the hunt for a competitive edge. With CleverTap, you can quickly achieve this through our Rich User Profiles feature. Conversion funnel anlaysis helps you understant how exactly people are interacting with your app. It visualizes the user journey to show you how many convert and where they drop off.